There is a good reason that the St. Anton ski area is known as an absolute El Dorado by people from the entire world. It is probably due to the large number of slopes and options available, as well as the overwhelming size of the 50 km³-large skiing area. All your dreams will come true, no matter the type of winter sports you are looking for. 200 kilometres of deep snow and firn slopes offer a perfect skiing experience to skiers and snowboarders. A great landscape and guaranteed snow are St. Anton’s special bonus. A particular highlight is the 10.2 km-long slope from Valluga to St. Anton that goes past the Ulmer Hut. There’s a perfect après-ski location for every taste. From the Rodelhütte where celebs meet, Krazy Känguruh by ski racer Mario Matt or the Mooserwirt, it is worth making a stop. St. Anton meets the highest culinary demands. It is also possible to sleep in “noble beds” and to go bargain hunting in stores of all the big luxury brands. 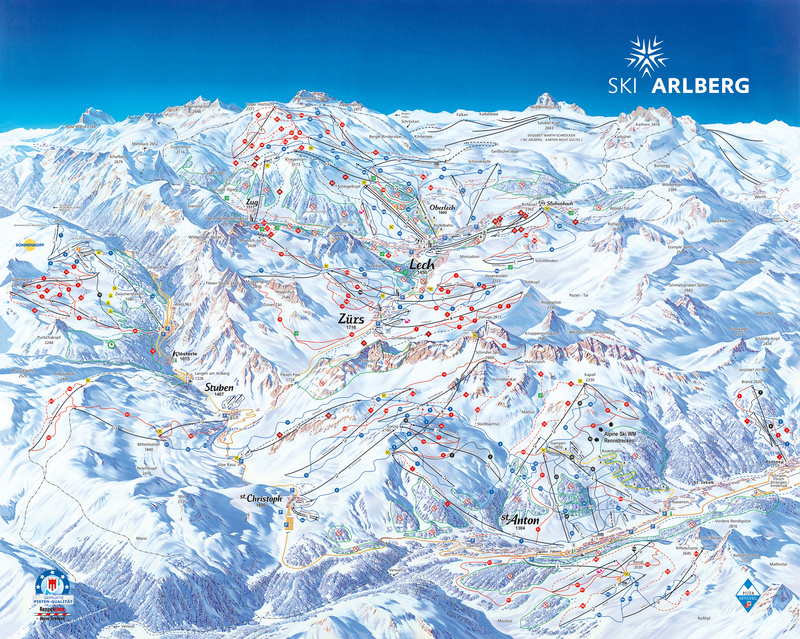 The loop closes: Skiing on the Arlberg will then be even more fun! The new cableway link on the Vorarlberg side of the Arlberg, between Zürs and Stuben/Rauz, as well as the new cableways to be constructed in 2016 – the Trittkopfbahn I and II and Albonabahn II cableways – involving a total investment of EUR 45 million, are closing the loop. From Zürs, Trittkopfbahn I leads to the new intermediate station, from where skiers may either continue to the new top station of Trittkopfbahn II or use the new Flexenbahn to carry on to Alpe Rauz in Stuben. From here, the other new cableway, Albonabahn II, will invite skiers to continue to Stuben. In addition, skiers starting out from Alpe Rauz can conveniently explore the St. Christoph and St. Anton skiing areas. This means that all resorts of the Arlberg skiing area – St. Anton and St. Christoph, Stuben, Zürs, Lech, Oberlech as well as Schröcken and Warth – will be easily and comfortably accessible on skis. With the new cableway link, skiers on the Arlberg – Austria’s largest contiguous skiing area – will have easy access to a total of 305 km of downhill slopes and 87 lifts and cableways. This guarantees an incredible dimension of skiing fun! Key points/Links The Skigebiet Arlberg consists of the villages of St. Anton, St. Christoph, Stuben, Zürs, Lech, Warth und Schröcken. Specialties: Cable car with Ferris wheel, special weeks such as “Ladies First” wellness weeks, the finest gourmet cuisine, multifunctional sports centre and ARLBERG-well.com.